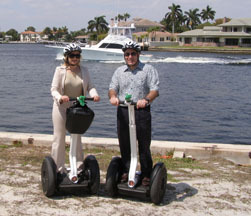 The Adventure Kids aka Debra C. Argen and Edward F. Nesta have another great adventure, riding Segways and Electric Bicycles with M. Cruz Rentals in Hugh Taylor Birch State Park in Fort Lauderdale, Florida. 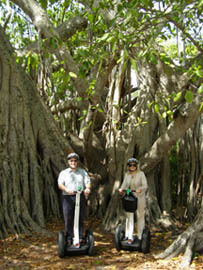 Luxury Experience readers know that we thrive on new adventures, and when we heard about the Segway tours by M. Cruz Rentals we could hardly wait to try these exciting "toys." We first saw the Segway, a battery-charged upright 2-wheel vehicle, referred to as "personal transporters" at a technology show several years ago, and later saw them used at airports and also by police departments. Recently, during our travels around the country, we have seen a few Segways pop up now and again, and each time that we saw them, we wanted to take a ride on this innovative and eco-friendly way to travel around. Located at the entrance to the Hugh Taylor Birch State Park, M. Cruz Rentals, owned by Brent, his wife Nina, and their son, Mathieu Cruz Wysocki, for whom the company is named, not only rent the Segway, they also rent bicycles, tandem bicycles, electric bicycles, canoes, kayaks, rollerblades, and even electric scooters; we had found the right place for a morning of adventures. 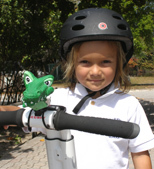 When we learned that Mathieu, age 6, the CEO in training, who has been riding the Segway since age 2 was to be our instructor we knew that this was something that we, too, should be able to master. What we learned from Mathieu and Brent is that the most important step is finding your balance point while keeping the two-wheel Segway, which has a waist high steering lever, in a vertical position. 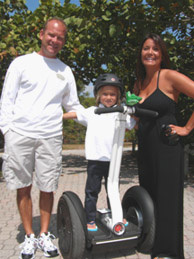 Brent informed us that the Segway uses independent transmissions and computers, which control each of the wheels. In addition, the computers take over 100 readings per second to monitor your balance and to control neutral, moving forward, reverse, or turning. 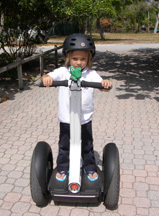 To move the Segway forward, Mathieu demonstrated that you merely lean slightly forward and it rolls ahead, to move backwards you lean slightly backwards, and to turn you lean to the right or the left. After watching Mathieu demonstrate each of the positions, we were ready to hop on and experience this for ourselves. Helmets secure, we positioned our feet on the platform of the Segways, and with careful coaching from Mathieu and Brent, we learned to slowly move the Segways forwards and backwards, and more importantly learned how to stop before learning the more difficult maneuver to turn. Proud of our accomplishments thus far in the training area, we were ready for the big time, riding first on-road on the pavement, and later would advance to riding off-road through Hugh Taylor Birch State Park. The road around the park is 2-miles long, and soon we were cruising at a maximum speed of approximately 12 miles per hour, yet on a Segway it feels like you are driving a Ferrari at top speed with the wind sailing past us. We made a stop alongside the Intracoastal Waterway and watched the Water Taxi and yachts cruise by, and smiled as we passed the picnickers having lunch in the park who looked at us with a bit of a surprise on their faces wondering what we were riding. Having mastered riding the Segway on-road, our next challenge was riding off-road on the trails with Mathieu leading the way and Brent riding behind us. Riding off-road is all about balance as the trails are often bumpy, which are fine for when you are walking, however present a bit of an interesting challenge at first to novice riders, yet we soon mastered the art and were zipping along under the beautiful canopy of trees punctuated now and again by strange looking tall grayish-white tree trunks devoid of limbs and leaves, which were the result of successive damage by Hurricane Katrina followed by Hurricane Wilma. While the trees now have a ghost-like appearance, the sheared flat tops provide the perfect vantage point for birds that like to perch on them and gave us an excellent opportunity to see a variety of colorful birds. 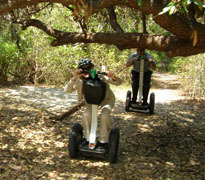 We also learned that riding off-road on the trails sometimes required us to lean down to pass under low lying limbs of the trees, mastering yet another Segway skill. Although more of a challenge, riding off-road did provide us with the opportunity to have a closer look at what was to become our favorite tree in the park, a 70-year old lofty fig that towered above all of the other trees, and has an interesting root system to support its many branches. As we circumnavigated this historic tree, Brent told us that just before the hurricanes arrived, the tree started sending out new roots from its branches towards the ground, as if it sensed imminent danger, and wanted to protect itself. Despite its massive size, the tree surprisingly was able to weather the hurricanes without sustaining any major damage. 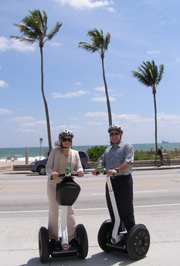 Riding through the park was a wonderful experience as we discovered its many secrets, yet we also enjoyed riding the Segways on the sidewalk that runs along the Fort Lauderdale Beach where we attracted a small crowd of people who craned their necks eager to see these somewhat unusual toys. 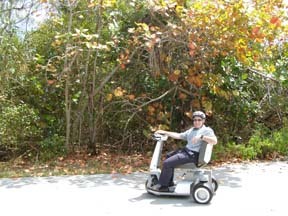 After experiencing the Segways for ourselves, we learned that they really are easy to use; in fact M. Cruz has given Segway tours to a wide range of people ranging from school-age children to octogenarians with limited mobility. Although reluctant to leave our new Segway toys, we also wanted to experience the electric bicycles, which are also very eco-friendly and although they have batteries, you can recharge them simply by pedaling the bicycle. 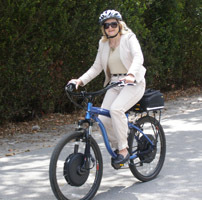 A bit heavier than a regular bicycle, the electric bicycles have a battery on the front wheel and an electric motion system motor on the rear wheel, bicycle handbrakes and a throttle like a motorcycle that you push with your thumb to electrically cruise along. Once again, helmets in place, we hopped on the electric bicycles, started pedaling to get the bicycle at cruising speed, then depressed the throttle and away we flew around the park, once again drawing smiles from the people that we had passed earlier who were walking, jogging, and picnicking in the park, however our favorite part was sailing by the people riding regular bicycles. 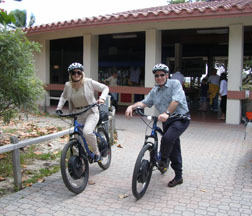 Although we both have mountain bicycles which (Edward) regularly rides, alas (Debra) is not so fond of this sport, but fell in love with the electric bicycle imaging how easy it would be to ride for long stretches and how convenient it would be to ride uphill with a minimum of effort. The electric bicycles are the ultimate in luxurious laziness for people who want to ride a bicycle without all the effort that it usually takes. As our final experience of the day, we rode electric scooters, which we learned surprisingly can almost match the speed of a Segway, providing the opportunity for families of all ages and abilities to ride together. Although M. Cruz Rentals also rents kayaks, canoes, and rollerblades, sometimes you have to know when you have had enough adventures for a day. Until our next adventure, we wish you happy and safe adventures of your own. M. Cruz Rentals is open daily. Call or email them for additional information. Read other articles on Fort Lauderdale in the Destinations, Hotels and Resorts, Restaurants, and Chefs' Recipes sections.